It is always nice to see some uplifting content. Thanks to the internet we all can enjoy the positive moments when people do good deeds! It seems that the media would always tend to bring out the negative headlines first, which is not the right thing to do. Unfortunately, this is what sells better and they take advantage of that fact. This is why lists like this one exist. If you feel like you are about to lose faith in humanity, the following images are what you need. We all know that some of the most valuable lessons in life are not taught in school. This means that parents have the big responsibility of teaching their children the important things in life. As the photo clearly shows, this mother is trying to set the right example for her son. She went outside with a big plastic bag to collect all the rubbish around her house. 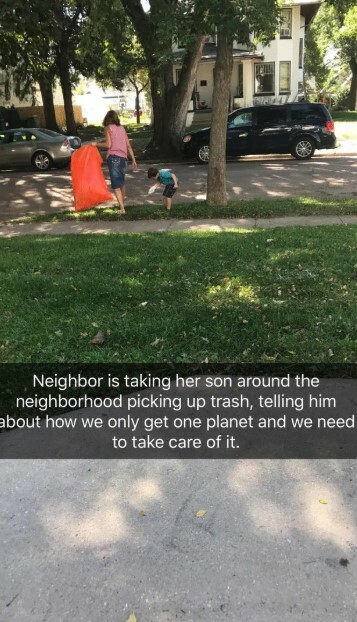 Of course, she took her kid to help her, teaching him not to litter and to preserve nature. 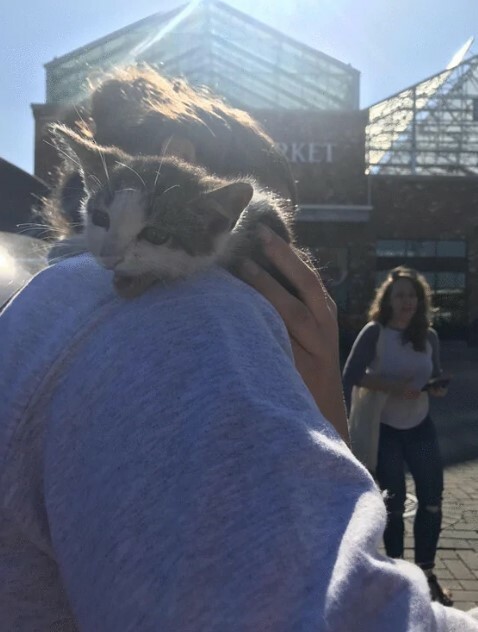 The dirty and really scared kitten you see in the photo was stuck underneath a vehicle outside of a Whole Foods location. Two strangers heard about the ordeal and stepped in to help. The spent about an hour trying to get the kitten out and eventually they succeeded! The scared animal had a surprise for their rescuers, too. It turned out that it had six toes on each paw. We hope that someone immediately adopted the cute kitten. The school you see in the photo is in a bad neighborhood where people receive low wages and the crime rate is constantly high. You would expect that the school and most of the other buildings would be completely trashed and covered in graffiti. 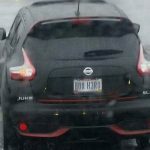 Well, things are not what they seem, at least not in this case. As you can see, there was some vandalism, but it was done in the most amazing and unexpected way! 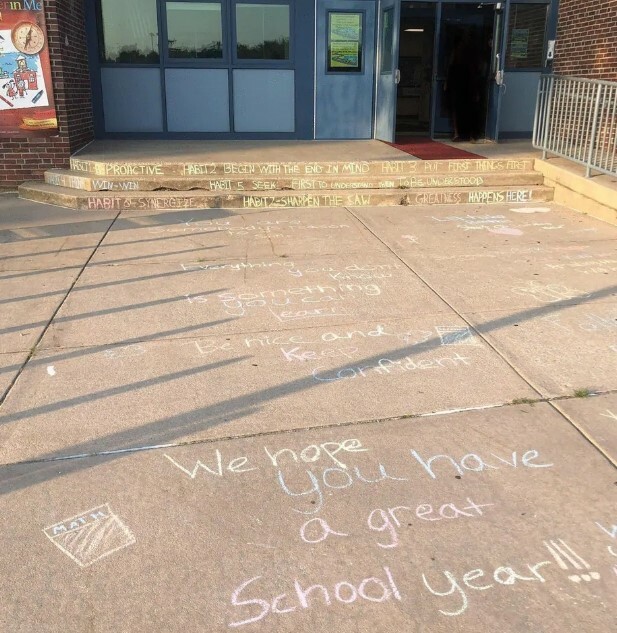 This is a really nice way for the school year to begin! Perhaps most of you know that victims of domestic violence or any kind of abuse are often too scared to seek help on their own. 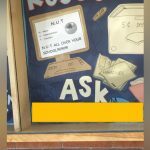 This is why the clever thing you see in the photo would probably be more than enough to help a lot of them take the first step and ask for help. 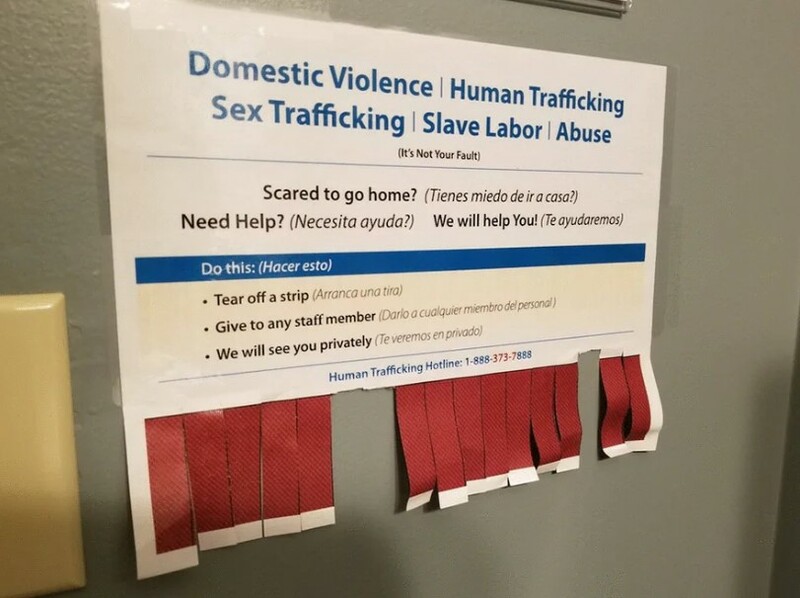 The subtle approach with tearing a strip and just giving it to a staff member is obviously working, because some of the strips were torn. We think that every victim should not hesitate to seek help from a professional, because everyone deserves a good life without pain and fear in it. Such people remain in the shadows in most cases, because they are simply doing their job. However, their line of duty often requires extraordinary skills and sacrifices. There is a huge difference between their daily routines and those of the ordinary people. This photo is the proof of what these professionals need to go through on a daily basis. The photo was taken after the Florence hurricane caused a lot of devastations. 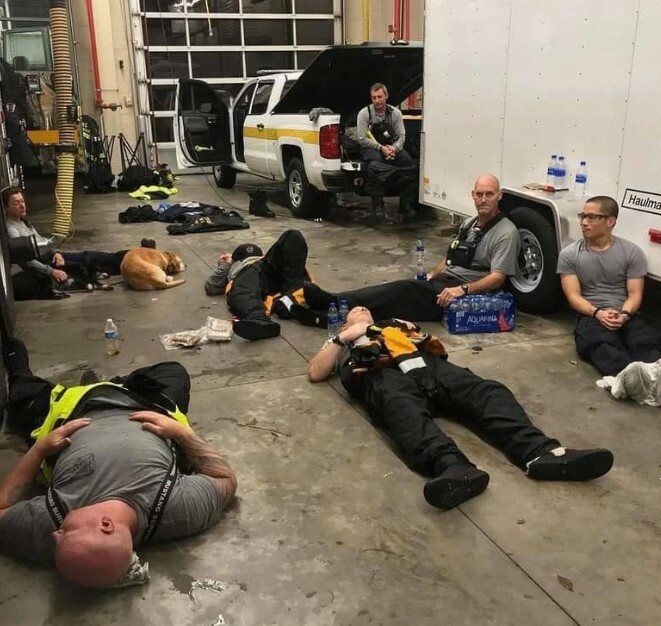 You can see how exhausted these heroes are after putting all their effort in the rescue operations. Animal are often helpless and it is up to us to do something about their well-being! 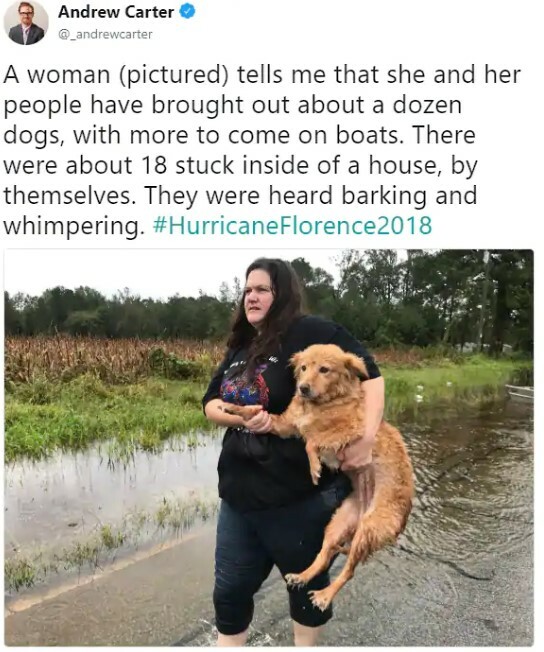 As you can see, the post describes how a brave woman was able to save a big number of dogs from drowning during the disastrous events caused by hurricane Florence. 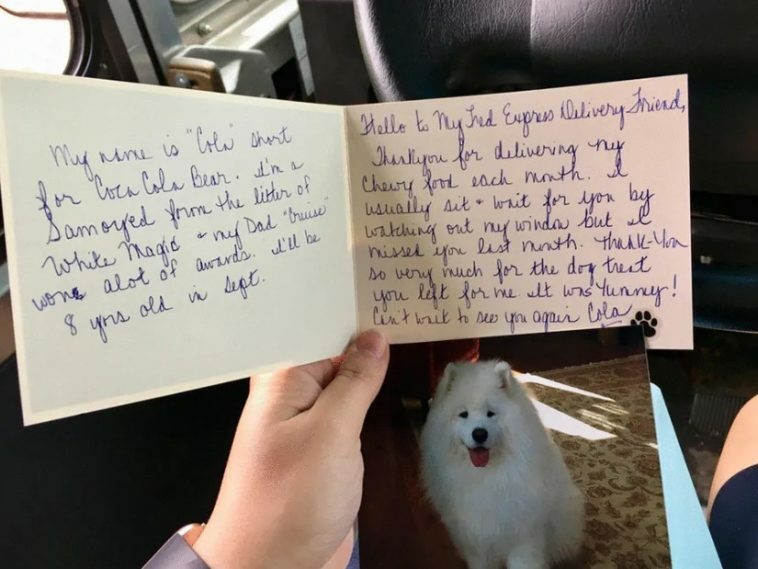 The selfless act of bravery and kindness to animals is admirable and we are really glad that she did her best and probably risked her life, too. This is always the right thing to do and if you can help, then you must go for it! They say that people are brought closer together by tragedies and disasters. We believe that this is true, because we have seen it happen. The image above is yet another example of people gathering to help a good cause in the face of an upcoming disaster. 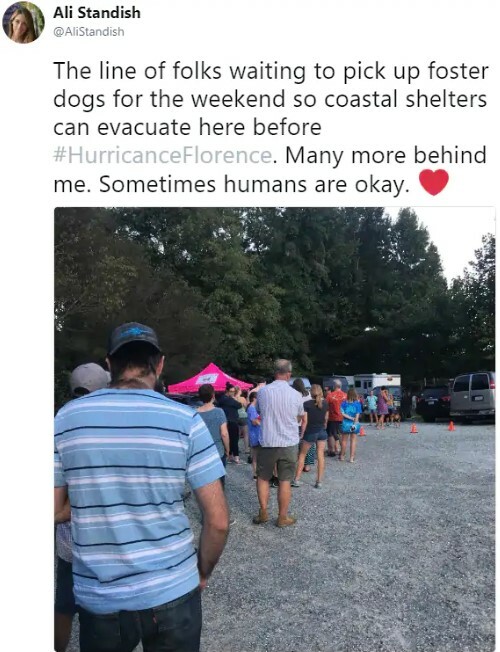 All these people are waiting in line in order to provide a foster home for shelter dogs during hurricane Florence. This way the shelter could provide help to a lot of animals that would be rescued during and after the hurricane. Someone bought a ranch from an elderly lady named Victoria. There was an old gazebo in the property which was almost completely destroyed. It even had no roof left on it. 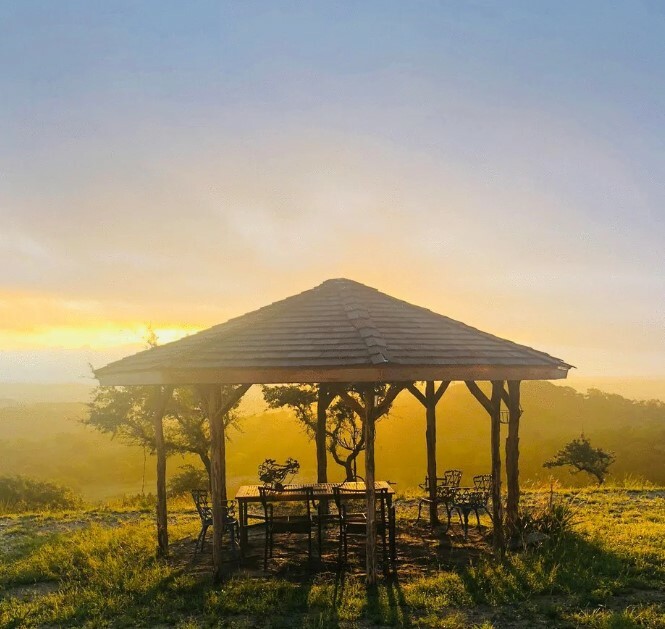 Just as the new owner was about to demolish it, he saw a tiny plaque that said that the gazebo was built by Jack with a lot of love for his Victoria 45 years ago. This was more than enough for the new owner to restore the structure back to its former glory and it became a really dreamy place. We are really glad that organizations and causes like Make-A-Wish exist. They attract a lot of candidates and volunteers who are willing to help those in need. The photo shows such a candidate who decided to do something very generous! His wish was very simple. 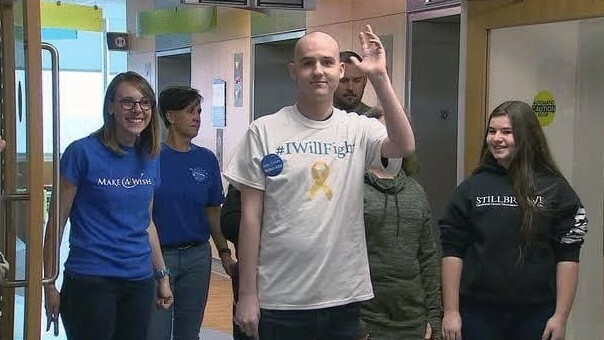 He donated 22 PlayStation 4s to the Pediatric Hematology and Oncology unit at in Falls Church’s Inova Fairfax Hospital. Imagine the amount of smile and joy he brought to the little patients with this amazing gift. This story is very amusing and really sweet! As you can see in the first post, one babysitter decided no tell the kids she was looking after that she was actually paid to be there. This is why she simply said that she works at Chili’s when they asked what she did for a living. 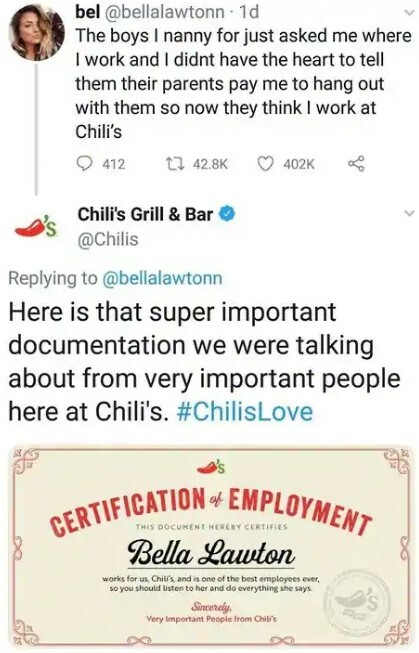 The surprise came when Chili’s stepped in and published a nice and probably unique document which verifies that the babysitter not only works there, but she is also a great employee. Of course, we are talking about clever marketing here, but it is still a sweet thing to do. 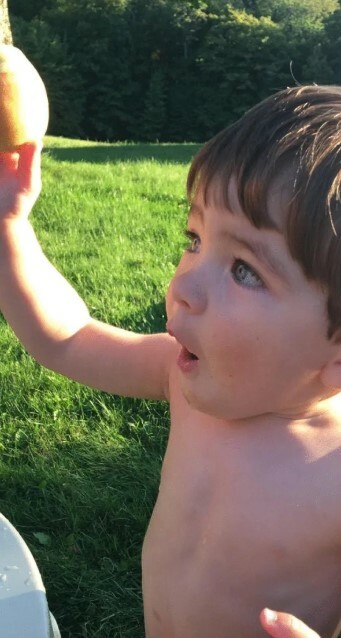 The kid you see here has probably no idea what the significance of that peach tree really is. His father actually bought that very same tree from a nursery years back as a gift for his girl. He told her that one day they will be picking peach fruits from that tree and enjoy them for a long time because they will always be together. He was obviously right and now the fruit of their love is enjoying the peaches. A lot of locations in the world have an urban part which is really close to wildlife. For instance, you could live in a big town and a forest reserve could be right next to it. This means that encounters with wild animals would be frequent. People living at such locations are used to it and they often help these animals if they need assistance. 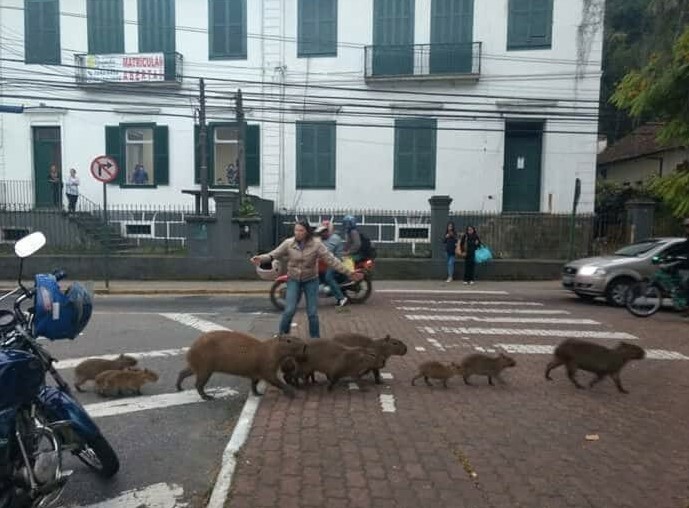 As you can see, a woman in a Brazilian town stopped traffic in order for the capybara family to cross the road. This is one of the best photos on this list for sure! A group of students in Belgium gathered and carefully restored some old WWII tombstones. This is a really good cause and it has a lot of benefits besides the renovation of the tombstones. This is an ideal way for the students to show they honor those who have fallen in the wars and to pay their respects to them. Here is one situation that really meant a lot for someone. 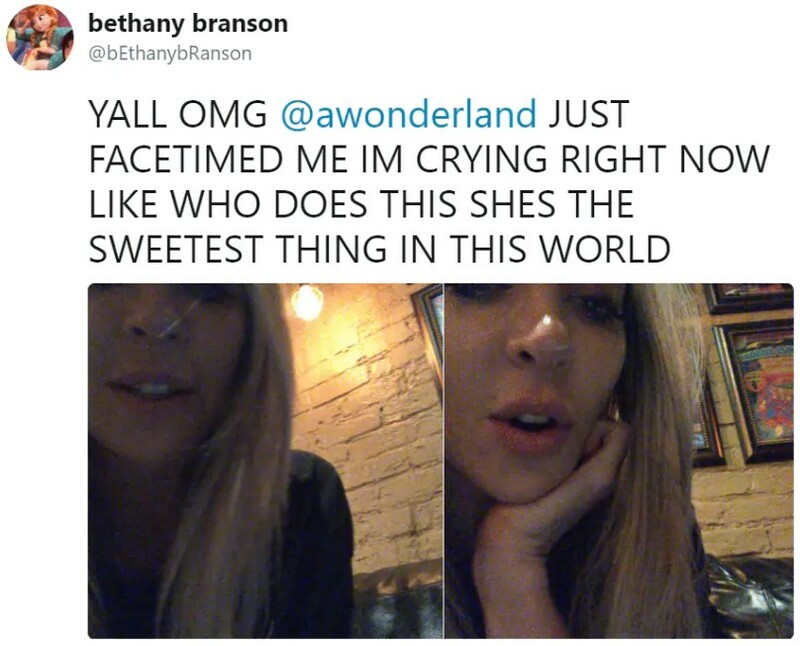 DJ Alison Wonderland surprised a fan by FaceTiming her after she learned that the fan underwent a kidney transplant which stopped her from being able to visit the DJ show. You can clearly see how overwhelmed the girl felt! This surely meant the world to her and we salute this DJ for doing the right thing! 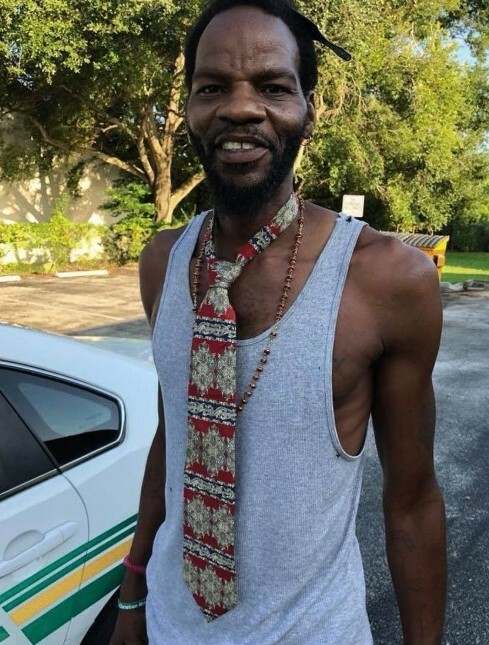 Polk County Deputy Scott Marcum posted this photo on social media, explaining that this was Mr. Grimsley who wanted to go to church, but also needed his tie to be tied. He was going to his father’s house to get that done when the deputy stopped him. He offered assistance and the tie was tied, which apparently made Mr. Grimsley a happy man!